Until I took a detour, the surroundings were no different from the many interior highways that run through the state of Karnataka. From then on, it seemed a different place with Tibetan scripts written everywhere, fluttering prayer flags, strolling maroon robed monks and the waft of Tibetan cuisine from restaurants. Though Bylakuppe is geographically in Karnataka, it did seem like I was transported a few thousand kilometers away to the highlands of Tibet. Despite the influx of tourists in the last many years that has made it a far cry from the serene Buddhist settlements up in the Himalayas, Bylakuppe still remains a secluded place away from the maddening world outside. Located in Mysore district and bordering Coorg, Bylakuppe is the largest Tibetan settlement in India, south of the Himalayas. Bylakuppe was established in 1960s when the then Mysore government allotted 3000 acres of land for Tibetan exile settlement. They were also provided with houses, schools and primary health care. Home to tens of thousands of Tibetans who have come from places as far as Tibet, Nepal and even Mongolia, Bylakuppe can arguably be called the Tibet of South India. It is also home to all the four major schools of Tibetan Buddhism- Nyingmapa, Sakya, Kagyudpa and Gelugpa. Vast open lands strewn with Tibetan houses, prayer flags and colourful monasteries welcomed as I rode past many Buddhist monks. The most popular and visited monastery is Namdroling, which can be sighted from a distance. I quickly walked past the hordes of visitors into the premises of the monastery. It gets quite crowded here during the weekends. Believed to the largest teaching centre of Nyingmapa sect, Namdroling monastery houses more than 4000 monks who come here to study. Zangdog Palri Temple is the first attractive structure as you enter the temple. I feel this temple arguably has the most beautiful exterior amongst all other temples and monasteries in Bylakuppe. The hemispherical structure atop its roof is definitely the highlight of this temple. To the left of it lies Padmavasambhava Buddhist Vihara also referred to as Golden temple. With coulourful wall paintings beside its entrance, the interiors can leave a first time visitor gaping for a while. The 60 foot tall statues of Guru Padmasambhava, Buddha Sakhyamuni and Buddha Amitayus sit serenely amidst the colourful paintings, sculptures, small statues and other paraphernalia. Made of copper and plated with gold, the insides of the statues have scriptures, relics and clay moulded stupas. I sat down near one of the colourful pillars to get away from the crowd who were keener on taking selfies than soaking in the ambiance of the temple. Visitors aren’t allowed near the statues and can be viewed only from a few feet away. However, Tibetan visitors are allowed to go atop the raised platforms to pay their homage, and were let in by the lone monk who patrolled around. If not for the crowd, the huge hall is an ideal place to meditate and let go of your worries. After a few minutes of meditation, I strolled around the hall which also has numerous colourful wall paintings that depict the life story of Buddha, his disciples, various deities, throne holders of Palyul tradition and scholars of Nyingmapa sect. As more crowd walked in, I headed out to the nearby prayer hall where gongs were played and hymns were chanted. Visitors aren’t allowed inside during prayer time and hence had to listen from outside. On my way out of the monastery, spotted a few young monks playing badminton in a narrow passage near their lodging facility. Though they follow the schedules of their monastic life, the monks do find time for their recreational activities and to go around Bylakuppe or the nearby town. Opposite to the golden temple is a line of shops that sell a variety of Tibetan items, artifacts, jewellery, books and flags. This is an ideal place to pick up a Tibetan souvenir. A stone’s throw away from the golden temple is the Nyingmapa nunnery, which was devoid of any crowd, a stark difference from the monastery. I was the only visitor there and contemplated going inside the shrine until a few Tibetans came along to pay homage. I tip toed inside along with the Tibetans. Vibrant colours, artworks and glassed statues adorn the interiors. As I walked out after a while, spotted a few nuns enjoying a meal in the garden outside. When requested for a capture on my camera, they happily gave thumbs up and posed. A short ride of 2-3 Kms led to Tashi Lhunpo monastery, the youngest of all the monasteries in Bylakuppe. A young lama peeped out through the gate and smiled. He ran in to call his friends as I entered the premises of the monastery. They wanted their photo to be clicked and wanted to click too. With beaming smiles they posed and went back to their game of corridor cricket and I walked towards the monastery. Though I initially mistook a small prayer hall to be the monastery, Tashi Lhunpo monastery is actually the largest one in Bylakuppe which can accommodate thousands of monks. It stands intimidating with a fleet of steps that lead up to it. Decorated with colourful paintings near the entrance, the interiors are adorned with pillars, hanging colourful papers, Tibetan scripts, wall paintings and a tall glassed statue of Buddha. Belonging to the Gelugpa sect, it is definitely the most colourful monastery I have been to. Sera Je and Sera Me which lies a few kilometers away, are also schools of Gelugpa sect and is home to thousands of young monks. It was a bit tough to locate Kagyudpa monastic institute as I rode around for a while and enquired numerous times to get there. Outside the entrance gate, three beautiful chortens stood tall along with prayer wheels. With absolutely no other visitors, the monastery which belongs to Kagyu sect of Tibetan Buddhism had a serene ambiance and a well kept beautiful garden. A few monks crossed paths as I strolled around. The monastery also has an incense manufacturing unit within its premises. The maroon coloured Tsechen Choekorling is located just before the Namdroling monastery while coming from the highway. This was another monastery which was devoid of the crowds. Though the monk near the entrance said it was open and I could go in, the bright red door remained closed. As I stood there confused, a Tibetan mother and her two kids walked in through the side door and I quietly followed them. The small tables and cushions were still inside the hall and it seemed that the monks had just left after their prayers. Though not as colourful as other monasteries’ interiors, the predominant colour was yellow and not maroon. 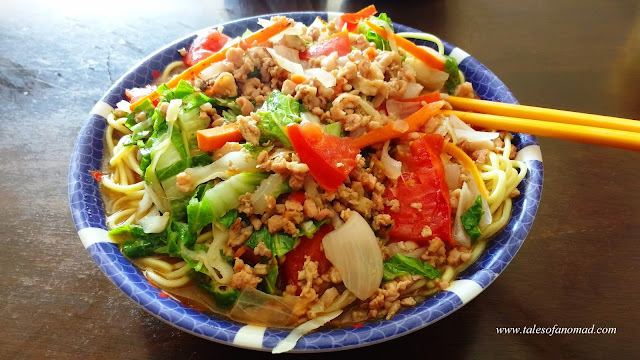 When in Bylakuppe, how can one leave without having a taste of Tibetan cuisine? I rounded my visit with a Thukpa and momos (dim sum) at one of the Tibetan restaurants near the golden temple. Thukpa is a noodle soup, while momos is a type of filled dumpling. There are both vegetarian and meat varients available for both the dishes at all the restaurants. Though it has got quite crowded over the years, the monasteries apart from Namdroling (golden temple) are mostly devoid of visitors. To have a serene experience of a Tibetan Buddhist monastery in Bylakuppe, these are the ones to visit. A few monasteries also provide accommodation and vegetarian food. A visit during the festivals such as Losar, Buddha Jayanti etc. would be a great time to be at these monasteries of Bylakuppe. Kindly check with the monks before taking their photographs. Be modestly dressed and avoid revealing ones. Prayer wheels are to be turned in clock wise direction only. Most monasteries close by 5 PM. If you don’t have a vehicle, autorickshaws are the only modes of transport available to go around Bylakuppe. Closest major railhead is at Mysore (85 Kms) and nearest airport is also in Mysore. There are frequent buses plying between Mysore and Coorg. Get down at Kushalnagar and take an autorickshaw to reach Bylakuppe. There are numerous restaurants and small cafe near golden temple and on Bylakuppe main road which offers both Tibetan and multi cuisines. There are more options available at Kushalnagar. Bylakuppe has a few homestays, apart from accommodation at the monasteries’ guesthouses. However, there are more mid range options available in Kushalnagar. If you are keen on luxury, Amanavana and Windflower resort are a few kilometers ahead of Kushalnagar. I missed this part of coorg. Do head there next time. Very nicely written post.. Bylekuppe is indeed a mesmerizing place.. Very nice and colourful post. Thank you. With increase in number of tourists, many new restaurants have popped up. The Chinese state calls for submerging of all minority identities for promoting national cohesion and nationalism, effectively precluding the possibility of the assertion of Tibetan nationalism and autonomy. Because of the suppression of Tibetans in China, a large number of them have fled and settled in India . The Tibetan movement for safeguarding their identity, culture and political space has grievously suffered as a result of Chinese nationalism and China's Tibet policy. The fate of Tibetan nationalism is, to a large extent, tied to the dynamics of the Sino-Indian relations and the course of the internal Tibetan politics and that of its relationship with the community in exile in the post-Dalai Lama era. In the year 1959, when China invaded Tibet, and Dalai Lama sought refuge in India. Our government gave him permission to set up a permanent residence in Dharamshala, Himachal Pradesh in 1960. Tibetan refugees and followers set up a base in Dharamshala. As is widely known, this is the largest Tibetan settlement in the world outside of Tibet. Then in quick succession, the government provided land in Karnataka, and a second base for the Tibetans to set up schools, monasteries and camps. Thus, Bylakuppe came into existence. Bylakkuppe settlement was established in 1969 with an initial population of 2000 settlers, with the kind generosity of the Central as well as the Karnataka State Government, who had provided 2000 acres of forestland for settlement as well as for cultivation. Subsequently, through the cooperation of local Indians as well as with the moral and financial assitance from International Organizations , the Tibetan settlers, with sheer grit and determination, succeeded in converting the entire forestland into settlement area, thereby rendering 1800 acres land for cultivation and the remaining area being utilized for Housing and Infrastructure. Glad to know more about Bylakuppe's history. Wonderful place to visit. This post is quite detailed. Great place to visit and thanks for sharing with workable information . Went there a long time ago! It looks just the same and looks so beautiful through your lens! Thank you. It is quite still the same, except for the increase in the number of visitors. Glad you liked it, Deepa. Have been to this place long back, but did not know so much about it, missed the Tibetan food of course. Hope you had a nice time during your visit. Thank you for taking me into the Nyingmapa nunnery. I've only been to the monastery and the Golden Temple a couple of times. I still haven't gotten down to sharing the travel account from that second trip (which was the year before last) :D. Gosh it changed a lot on in the last few years, right -- in terms of the number of visitors? How is the trip coming along? Where are you now? Glad you liked it, Divya. I have been to Bylakuppe thrice earlier, but visited only the golden temple. Went beyond the touristy affair this time. Golden temple gets quite crowded during weekends. Am headed to coastal Karnataka and Maharashtra tomorrow.